Dragons are supreme mythical creatures, even the Emperor are symbolised by the dragon. It is believed that when the carp fish can jump through the narrow section, known as the Dragon Gate, in Chuan Jiang River it will become a dragon. Every year during spring time, at the down stream of the Dragon Gate gathers thousands of fish, because of the pinch in the stream the current is especially strong and being upstream only the most capable fish can make it through the gate. 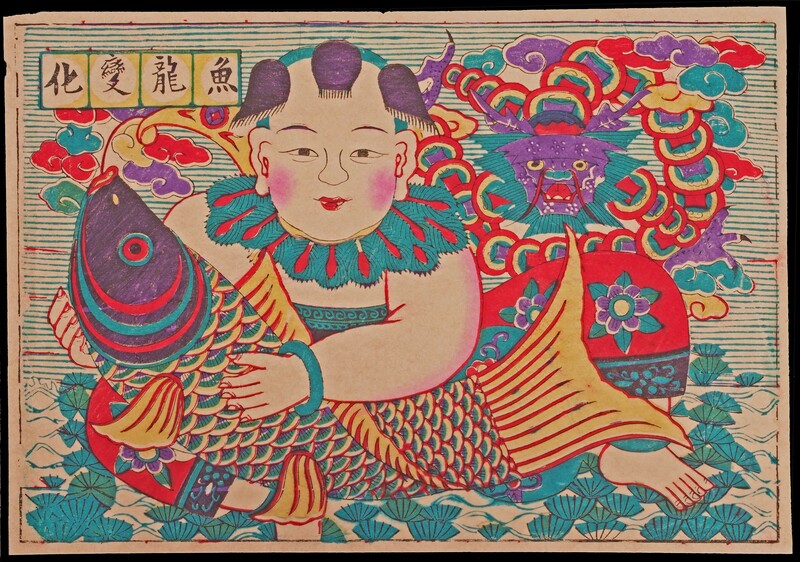 The transformation from fish to dragon is a blessing parents wish for their children, from the ordinary carp into the mythical dragon. 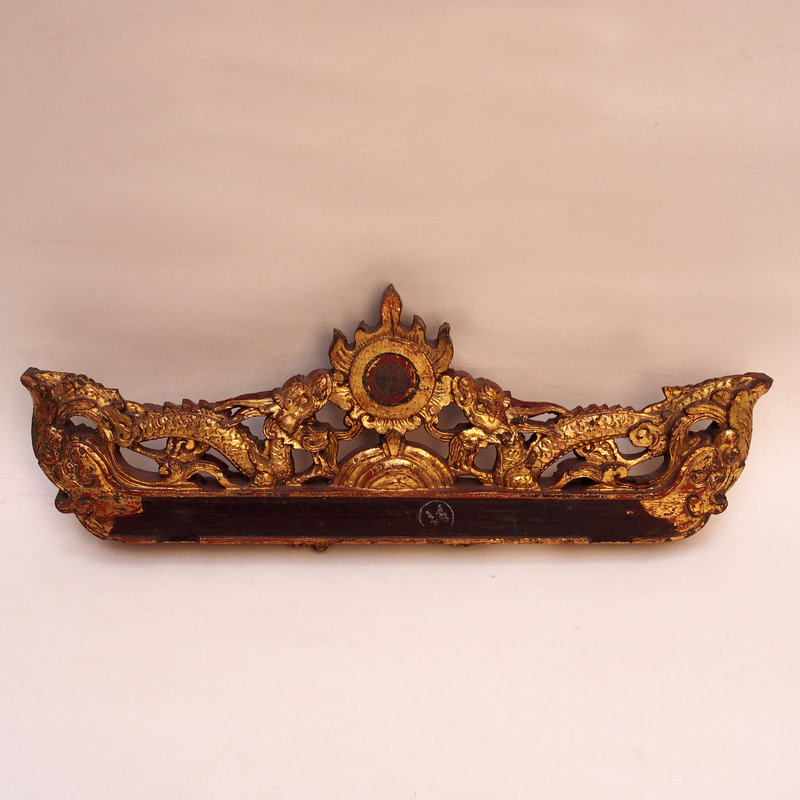 This golden wood carving used to be center pediment of an ornamental object, perhaps on small shrine in a temple. 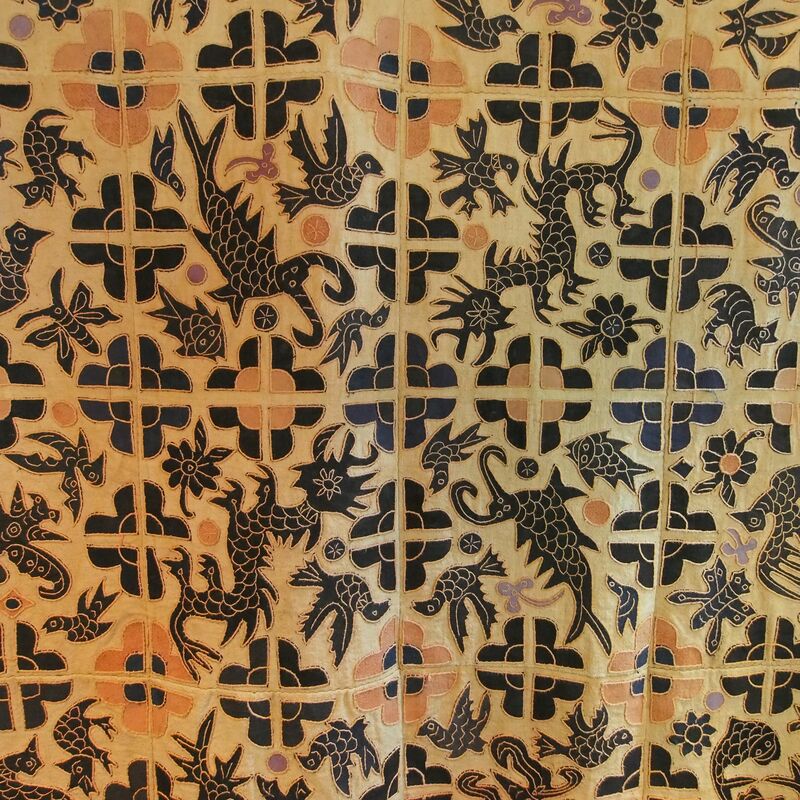 Dragon is a symbol for the Chinese emperor. It is believed that a long long time ago, the emperor he asked for a cauldron to be made as a record of his achievement. Ceremony was organised for the revealing of the cauldron and all the citizen as well as the saints are invited. The cauldron was over 3m tall, glittering bronze surface with a casting of a dragon flying through the cloud. While everyone is admiring the cauldron, the sky darkened, looking up they saw a dragon flying towards cauldron. Having completed all his tasks on earth, the emperor rode on the dragon and returned to the sky. A wall hanger embroidery, use for festivities such as birthday for the elders or for new born babies. Blossom of the Four Season Flowers – (Narcissus, Lotus, Chrysanthemum, Plum) representing good fortune all year round. Dragon & Phoenix – (Dragon a concept of mammals, fish and reptiles while the phoenix of the birds) the combination of the dragon and the phoenix is the totality, the perfect match. Kirin Delivery of a Baby Boy – (legend of how Confucius was born) and of course every parents would like to have a son as smart as Confucius. 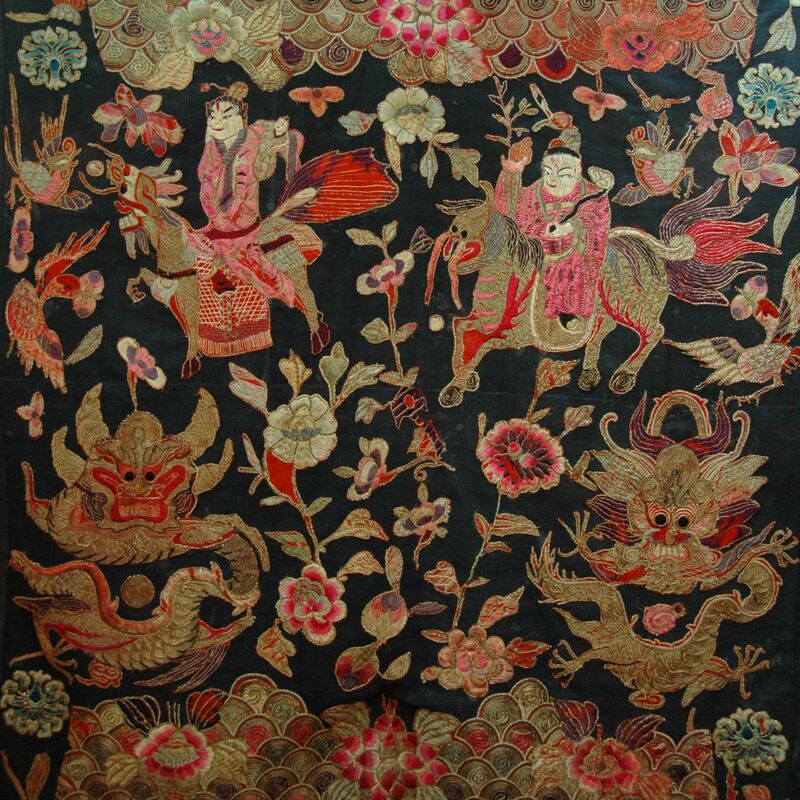 Ru Yi and the Birthday Peach – (man on a horse was holding a scepter and a birthday peach). The birthday peach representing longevity while the decorative scepter has the name of “as you wish”. It would be hard to guess what is the black metal badge behind the dragon. A bronze mirror! This mirror is unfortunately not polished, so you will not be able to turn it over to re-apply the lipstick after meal. For the Chinese, the bronze mirror is a lovers’ keepsake, a token of love. The story goes back to the Southern and Northern dynasty; a couple was departed during the war, the husband saw the bronze mirror in half and each kept a piece as a keepsake. Years later, after a lot of hardship the two was able to find each other with the token mirror. And finally the circular mirror was completed again. 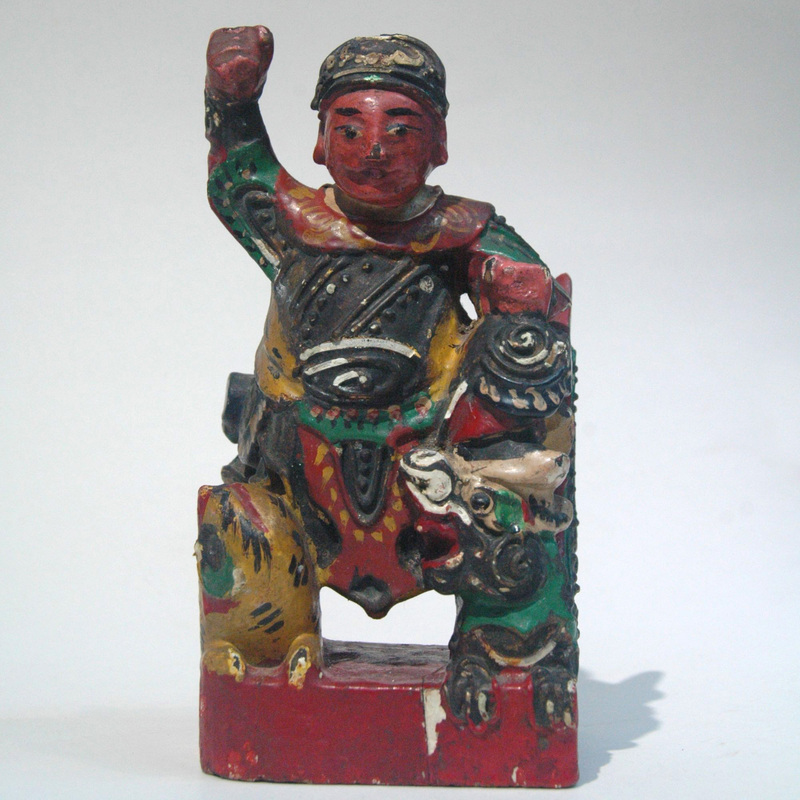 This antique lacquer figurine is that of the Bodhisattva Manjusri (文殊菩薩). Bodhisattva Manjusri and Maitreya are the often depicted with the Gautama Buddha with Manjusri on the left and Maitreya on his right, representing wisdom and teaching receptively. The creature Bodhisattva Manjusri is riding is a green lion (suan ni), the 8th son of the dragon. He adores the incense and sitting so you will also be able to find him as a decoration for the feet of the incense burner. 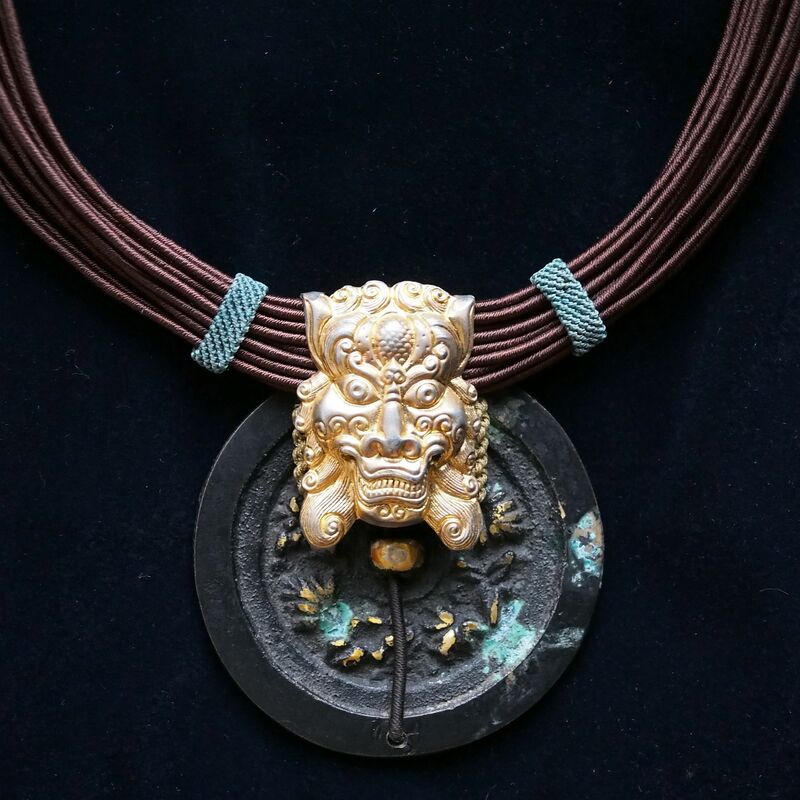 This necklace featured a piece of antique jade huang. 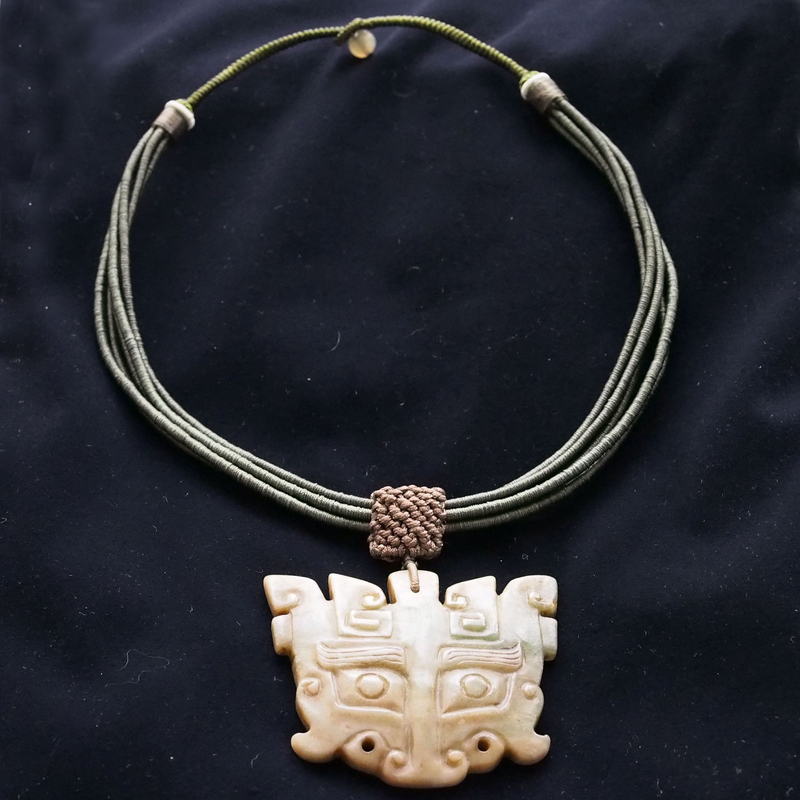 Jade huang is a form used for jade pieces dated all the way back to the Neolithic Age, some 8000 years ago. The arch shaped form started as a part of the costume for the sorcerer when practicing black magic. 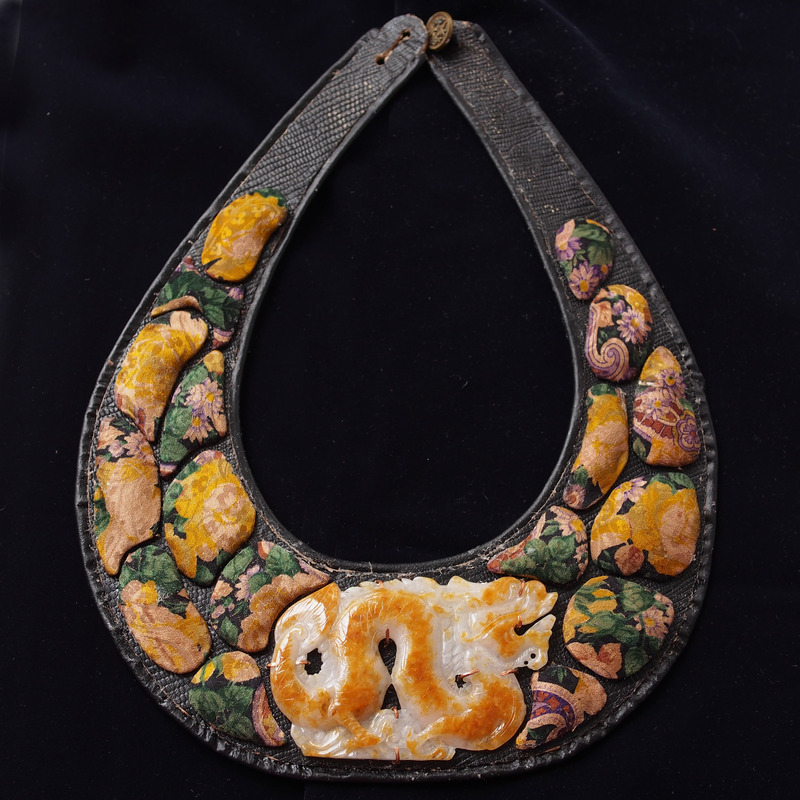 By Shang dynasty, 1000 B.C., it has developed into a costume ornament which acted as a symbol of social status. 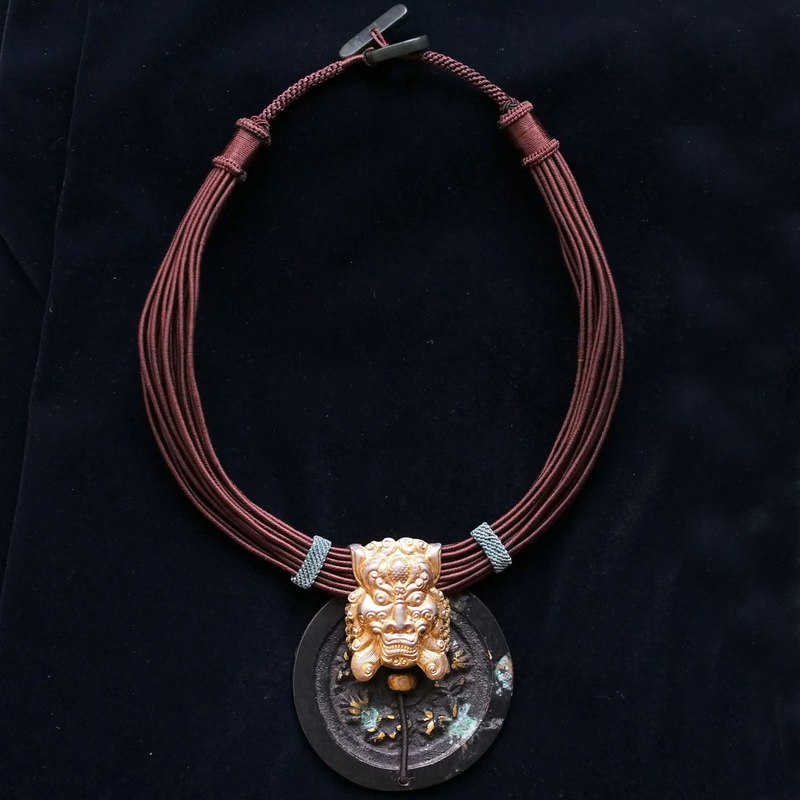 The fashion of jade huang ended and took over by the jade pei, a more decorative pendent. 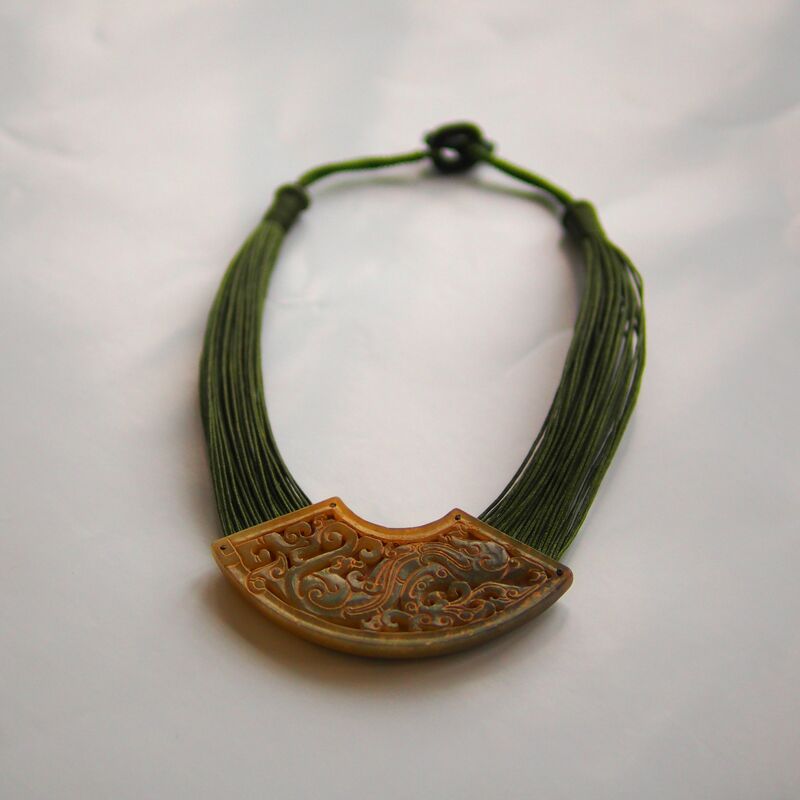 This jade huang has a carving of a dragon pattern. 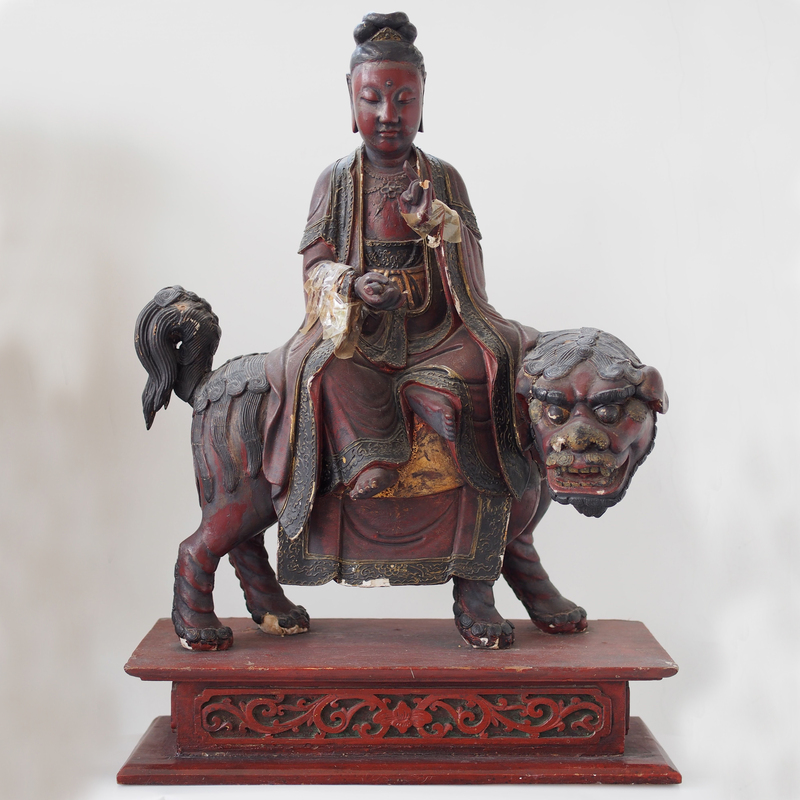 The courageous looking figurine, riding on a tiger on the right and stepping on a dragon on the left is in fact an ancestral saint of the fisherman of Hong Kong. For the Chinese both the dragon and tiger are creature of power, being able to control them would give extraordinary strength. These ancestral saint are kept and worshiped on the junk boat by the Tanka tribe for keeping safe their journey at sea.